There are two times of the year that I made a real effort to get to the farm with my kids, spring to see the baby animals and new growth in the fields and autumn to see the harvest. 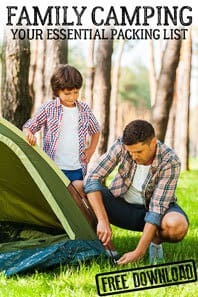 Growing up in the country it was important to me that even when we lived in a town that the kids when they were toddlers and preschoolers, felt that connection to the cycles of nature. 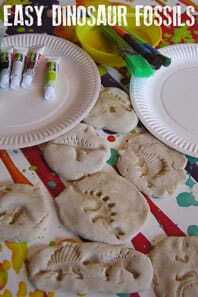 We would return from the farm in the spring and get creative with some fun crafts as well as using the farm theme in our learning and play. 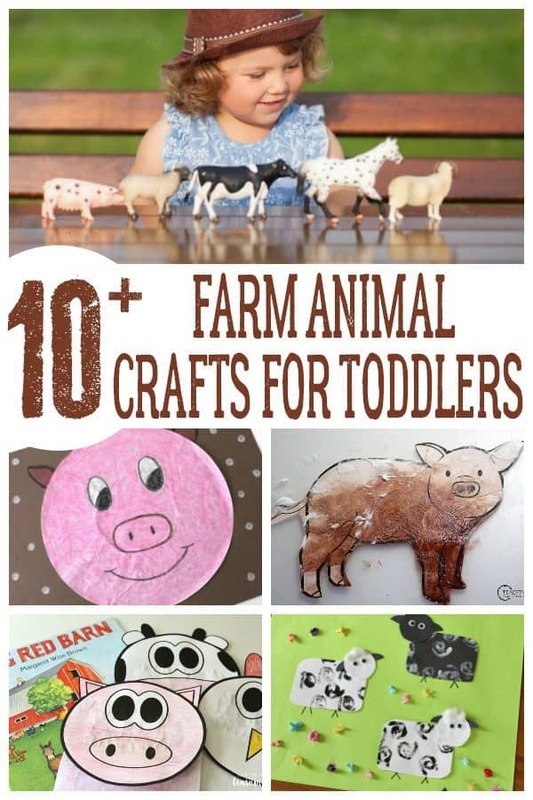 Today I’m sharing my favourite fun farm animal crafts for toddlers and preschoolers. 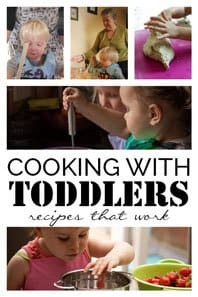 This list is ideal to make with toddlers and preschoolers, although when you start crafting with your toddler you can expect to spend more time helping them than when they are preschoolers. 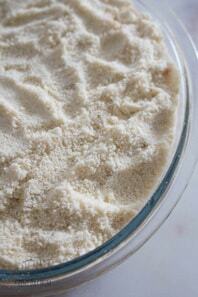 We have included affiliate links to products and resources that we use and recommend. If you purchase via these links we may earn a small commission. 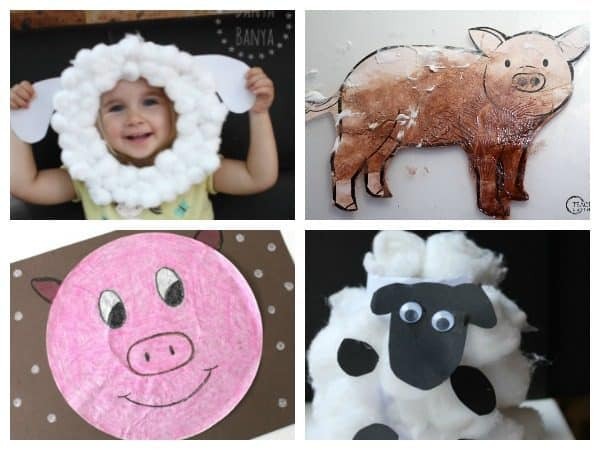 This is one craft to work on together – you will need to cut out the template for this Sheep Mask from Danya Banya but you and your little ones will have a lot of fun finishing it off and then they can act like a little lamb or sheep. This little lamb craft was fun to make with my two kids when they were toddlers and my preschool nephew. It was so easy the eldest of them was about to cut out the cloud shape and snip off some paper for the tail and legs, however, I did cut out the head for all 3 of them to make it easier. I love making pom poms with kids and this Pom Pom Sheep Garland from Coffee with Us 3 is great to make with kids – in the tutorial they use handmade pom pom makers but after many years I bought a set of pom pom makers and have been using them ever since. One of the things that we have daily in our recycling box is yoghurt pots and they make a great craft to model with. We never made Yoghurt Pot Sheep when mine were little but I remember seeing this from Crafts on Sea and thinking what a great idea it would be. How do you get the effect of wool on the sheep – well over on Buggy and Buddy they have a fantastic way of stamping the wool that makes these Spring Lambs the perfect craft for your tots. One of our favourite animals on the farm are the pigs and the cute little piglets, they feature in our favourite storybook The Three Little Pigs we’ve been inspired by that to create our own Storybook Houses for the 3 little pigs to live in. Another craft inspired by the same story and the little pigs and piglets running around the farm is this fantastic Three Little Pigs Storybook Craft from Ketchup Moms – I love that it is recycled and if you happen to teach preschool it would make a great display craft for your classroom. Whenever we head to the farm you can guarantee that we will see some extremely muddy pigs and this fantastic Muddy Pig Sensory Art from Teacher 2 and 3-year-olds is perfect to get creative and not that messy with once you return from the farm. Coffee Filters make a great resource to craft with and this cute little piggy from Look! 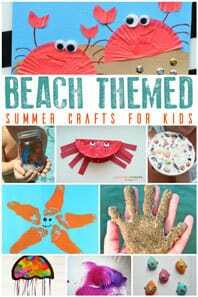 We’re Learning is a great simple craft that the kids will enjoy to make. 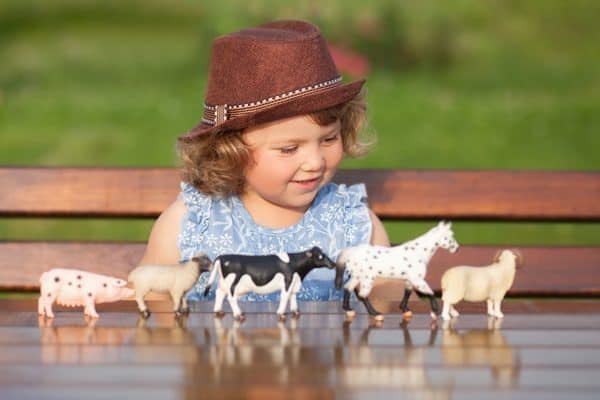 Growing up our nearest farm was a dairy farm I remember waking up and hearing the cows first thing in the morning and going to bed hearing them too, this Paper Cow Craft from Buggy and Buddy is perfect for making with toddlers and preschoolers. Cardboard Tubes and Toilet Paper Rolls are great for crafting with and this Goat Cardboard Tube Craft from Sight and Sound Reading is perfect for kids. I love the little extra cutting practice that your toddlers and preschoolers can get as they make the beard. 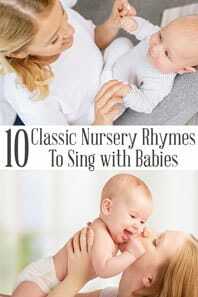 Even if you can’t get to the farm this Spring or Autumn to see the animals, dig out the song words and start by singing this favourite Farm Nursery Rhyme and then get creative here’s just a few ideas to inspire you and your little ones. 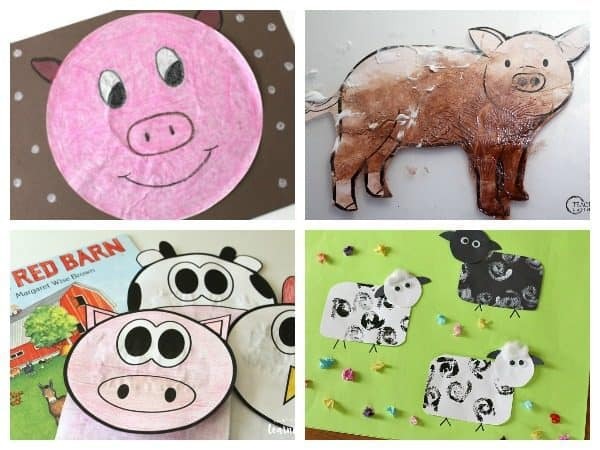 Create some Farm Animal Paper Bag Puppets like these from Look! We Are Learning. I love how you can use them to be the characters in the song. We love puppets they are great for adding as props for circle time, songs and storytelling these Old MacDonald Spoon Puppets from Teach me Mommy are fun for the kids to create but great to use afterwards as well. 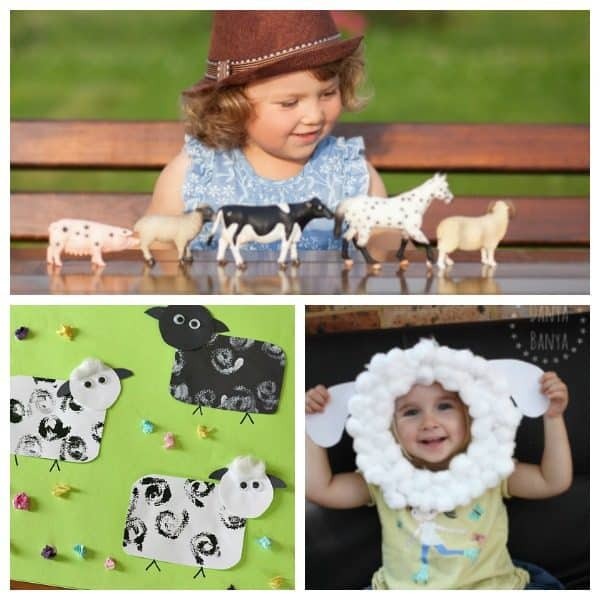 Your toddlers and preschoolers will love painting and sticking on the extras to these Simple Peg Farm Animals from Danya Banya. 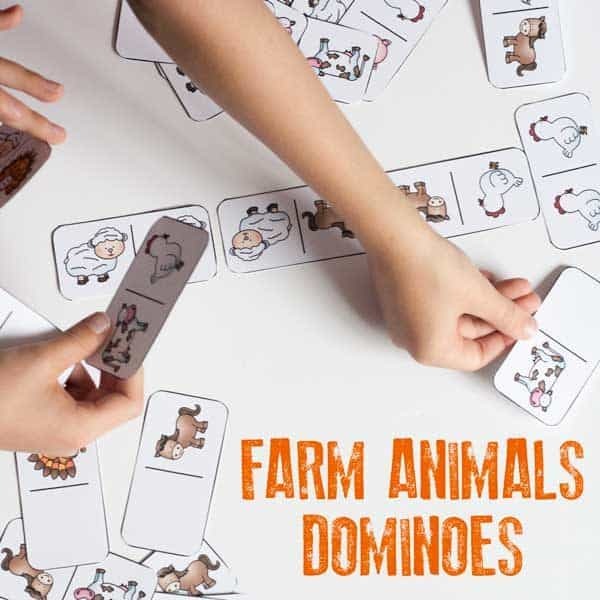 Sign-up to our weekly Book Based Activities Newsletter and get your FREE Farm Animal Dominoes to print and play with your toddlers and preschoolers. Join our Toddler and Preschool Activities and get your Domino Game NOW! 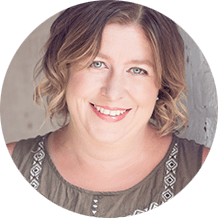 Once we have got creative it was time to quieten down with the hope that my kids would have a nap (unlikely but I did dream) and one of the best ways I found to do that was by reading aloud to them. Here’s just 3 of our favourite Farm Animal Books.